You have yahoo mail account and you are not using it but you are getting notification continuously in your iPhone and desktop. You can easily deactivate your account permanently. If you have decided to delete your Yahoo mail account, remember you will lose all access to your account, and all your email will be deleted. You will not have any longer access to your Yahoo mail, your photo, your flicker account and other data which store in Yahoo services. If someone tries to send a message to your email address, it will immediately get a delivery failure message, once you delete your account. Some easy steps mentioned below to delete your account from desktop and iPhone. Open your Yahoo Delete User Page with this link https://edit.yahoo.com/config/delete user and login into your account. After login, a page will appear, on which you will find detail about what you will lose when you delete your Yahoo mail account. After reading this, click on the continue button. It will ask to enter your email address again. Fill the given captcha and select “yes, terminate this account”. Click on Sounds good button to return to Yahoo’s homepage. From this method, your account will be deactivated from your desktop and phone. Delete your Yahoo account from iPhone: This process will delete your Yahoo mail account, but that removes your account from your iPhone but not terminate your Yahoo mail account; you will still be able to access it from other devices and browser. Note: if you deactivate your account from the browser then you will lose all access of your account if the same account is open in your phone. It deactivated, you don’t receive and sent any email from this account. You need to remove this account from your iPhone/phone. Select the Yahoo account that you want to delete. 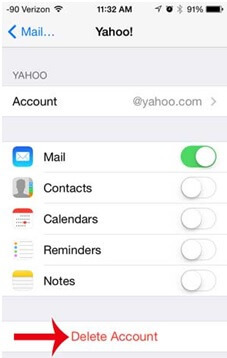 Touch the Delete Account button again to confirm that you want to remove your Yahoo account from your iPhone. It will remove from your iPhone. Your account has been removed from your phone, now you will not get any notification from your account. Once you deactivate your account you can’t be able to recover your account.